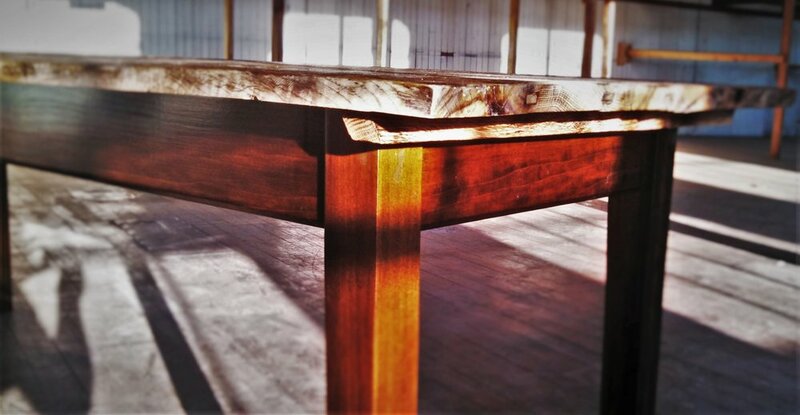 A gallery custom, hand made rustic furniture made from reclaimed hardwood. All pieces can be made to any size. Although this type of furniture differs from some of my sculptural pieces, these rustic pieces are a lot of fun to make. I'm lucky to live so close to a few Amish sawmills. They use massive circulars saws to rip down the lumber that leave deep saw marks in the wood. I usually use white oak, but other varieties of wood are available. The oak looks great finished naturally or sometimes a bring out a blow torch and "toast" it, to really create a lot of contrast. This client won a Jameson whiskey barrel and wanted a coffee table out of it. I thought toasted, white oak would work well for the top, since the same wood comprises the barrel. The aroma was unbelievable when I cut the barrel in half. I haven't seen very many Jameson whiskey barrels for sale but Jack Daniel's seem to be readily available. Two or more barrels can be added for a larger table. One of the great things about living here in Eastern PA is the availability of roughsawn oak, that I get from the Amish. The large radial saw blade at the mill leaves pronounced blade marks in the wood that I highlight by "toasting" with a torch, similar to how wine barrels are prepared, for a very rustic look. Available in any size you can think of with a variety of bases ranging from modest dyed poplar to more expensive hardwoods. 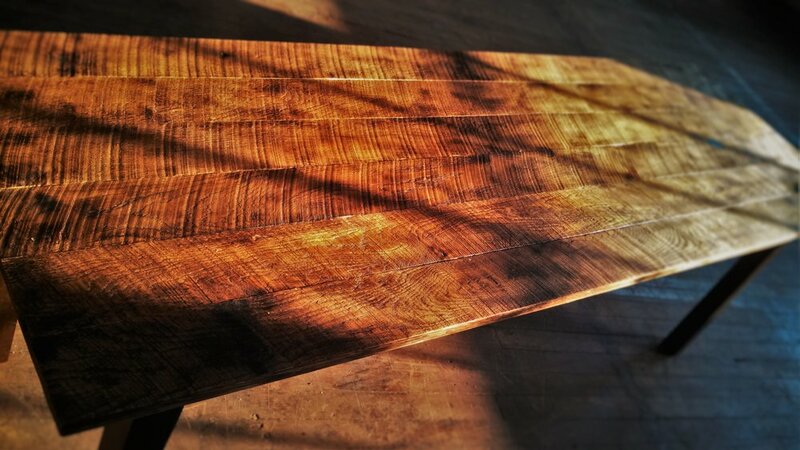 A coffee table with a white oak top made of irregular planks pieced together and roughly planed. Four large Amish oak legs are fastened with black pipe.